Dakota jump-started the mid-size pickup scene last year and continues to stand alone as the largest, strongest and most capable mid-size pickup truck on the market. With best-in-class torque and towing, Dakota delivers full-size pickup styling and power with the only V8 in its class. Dakota expands its lineup with four new high performance models: Dakota TRX and TRX4 Off-Road, Dakota R/T and Dakota Night Runner. 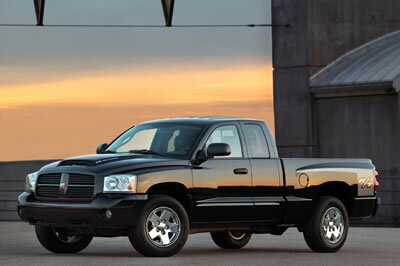 The four different factory-developed models combine Dodge Dakota’s class-leading capability with an array of features—from added off-road hardware to street-tuned body styles—that take the Dodge Dakota to the next level in the high performance truck market. Cab® Full-Swing rear doors that open nearly 180 degrees, and a new variable line pressure four-speed automatic transmission that improves fuel economy in the 3.7-liter V6 engine.